I love robot vacuums. It’s the easiest way to clean my messy house without requiring me to do much more than press a button. 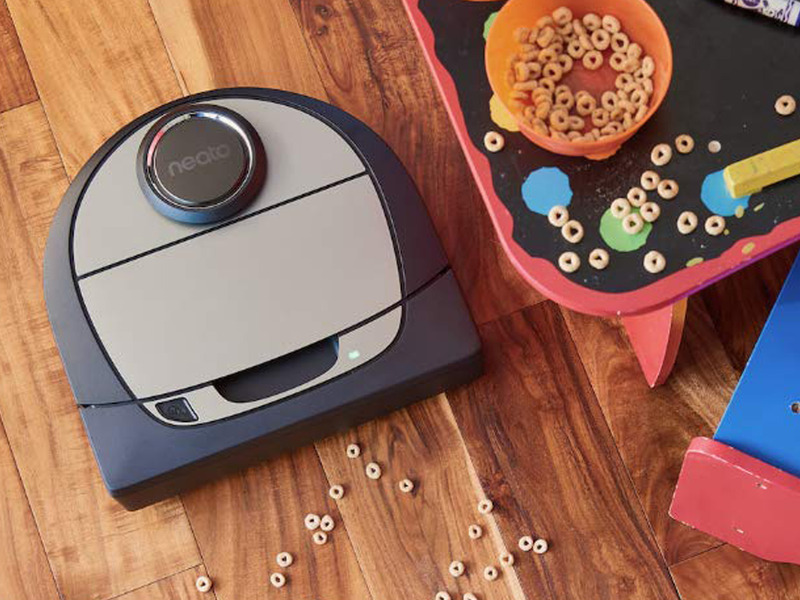 There are nice machines at a variety of price points that can go from hardwood to shaggy carpets without issues, empty their own dustbin, mop your floor, and more, but one that stands out for me is the top-of-the-line D7 Connected Robot Vacuum from California-based Neato Robotics. I’ve been using it in my own home for a while, and in my experience, it is worth the $793 price tag — here’s why. Unlike conventional robo vacs, Neato’s are all D-shaped, including the D7. This helps with cleaning corners better than others in my opinion, and just looks really unique and interesting. The D7 measures 12.5 inches by 13 inches by 4 inches. The four-inch height is higher than most robo vacs, which means it might have a harder time getting under low-clearance furniture, but wasn’t an issue in my experience. If I’m going to use a robo vac, I don’t want to monitor it as it goes around my house. That’s why I love that this one uses “laser smart technology” to map your home. You can set “no-go lines” after it maps each room so the D7 automatically knows not to cross over a heavily-wired area. You can also save up to three maps so you can conceivably use this vacuum to clean three floors, should you be so lucky to have that much space. The vacuum also comes with three ultra-performance filters designed to pick up 99% of allergens and dust mites. And, you can choose between eco and turbo cleaning modes; with turbo mode, the D7 uses maximum suction to pick up debris as small as 10 microns. Cleaning the Neato D7 is relatively easy, which I appreciate since I use the vac daily. After each cycle, you remove the dustbin from the top of the vac and tap out as much gunk from the filter as you can, or use the attached cleaning tool to cut out hairs and fibers off the brush. The filter has a screen over it so you can’t really use the cleaning tool to brush out the debris. The flour was a bit trickier, which seems to be the norm for robotic vacuums. On the carpet, it removed about 90% of the flour; on the hardwood, it was closer to 75%. I also sprinkled flour in corners of different rooms and though the vac didn’t get everything, it came within a quarter of an inch of the corners, which is better than any of the other robotic vacuums I’ve tested. The D7 also does a great job with pet hair, which I didn’t have to purposely set out because we have two cats who get the job done just fine. When I run the vacuum on its regular schedule, I didn’t notice any cat hair left on the floor. As far as noise levels go, this is also the quietest robotic vacuum I’ve ever tested. My sound meter measured it at 66 decibels from a foot away, which is just slightly louder than a normal conversation from three feet away. The “Connected” part of D7’s name comes from its smart capabilities. You can control the vacuum using the Neato app, Google Home and Assistant, Amazon Alexa, Apple Watch, and Samsung SmartThings. I tested it out using my Alexa and couldn’t help but marvel at the world we now live in — I can now talk to my Wi-Fi router and tell my robotic vacuum to start cleaning. Or you can just schedule the vac to clean at a specific time each day in the app, which I do. The D7 would get stuck about half of the time I ran a cleaning cycle, which is really annoying when you just want it to clean and go back to its dock when it’s done. But I probably shouldn’t lay all of the blame on the Neato. Between having a five-year-old and just not putting much emphasis on tidiness, I gave the vacuum plenty of obstacles to conquer and it definitely had the most trouble with small toys that were left out. Overall, the app is useful. It tells you when your Neato is stuck and when to empty the dustbin, and you can easily buy replacement parts and access maintenance tutorials. At the same time though, I wasn’t incredibly impressed. Many times when I wanted the D7 to dock or start cleaning, I would have to wait a few minutes for it to connect. I also couldn’t get the zone cleaning to operate correctly because the device may have had trouble accurately mapping our constantly changing decor or the obstacle course made up of toys strewn everywhere. Like I mentioned earlier, it’s also really expensive. Overall, I’m happy with how the Neato Robotics D7 Connected Robot Vacuum performed. When it comes down to it, the ability to clean a floor is the most important (and basic) feature a vacuum should have and the D7 delivers the goods without making a loud production of it. I could take or leave the mapping and Alexa functionality, but they are kind of fun tools to have at my disposal. If you are looking for a robotic vacuum with all of the bells and whistles and you have the ability to spend top dollar, you should definitely give the D7 Connected a try.